Notes: New students are welcome and for those who are learning 13 Grabstick from Tse Tai Sigong, we will polish the movements you have learned so far and you are welcome to develop your Damo Staff Warmups as well. Grandmaster Tse Wei Jing (Michael Tse) will again be visiting Australia and New Zealand to hold seminars and private lessons. We feel extremely grateful that Master Tse travels all this way to help us all develop our skill. Wednesday – Thursday, 27 - 28 February, 6.30 – 9.00 pm. Monday, 6 March 6.30 pm – 9.00 pm. For inquiries and full schedule with descriptions of each seminar – please use contact form on this website (or contact your Sifu). Slapping Healthy Gong is a short Qigong form that uses tapping with the fingers and palms along the body’s channels and acupuncture points to help stimulate and smooth the flow of Qi. This helps the body with healing and general well being. Along with learning the form, there will be a lecture as well as breaks during the afternoon for chat, tea and nibbles. The whole form will be taught at this seminar. No previous experience with Qigong is necessary to learn this form. ​Sifus Cynthia and Belinda will be holding another Wild Goose Qigong seminar in September. This will follow similar formats as the previous seminars where students who know the form are able to polish and refine their work; and students new to learning the form are able to add more to their work. The previous seminars have been very successful and Cynthia will have just returned from Instructors and the Wild Goose Qigong seminar in England so will be fresh with updates to pass on. Even if you have not attended previous seminars, you are most welcome to attend and start your journey with this beautiful form. This is likely to be the last Wild Goose Qigong seminar for some time. 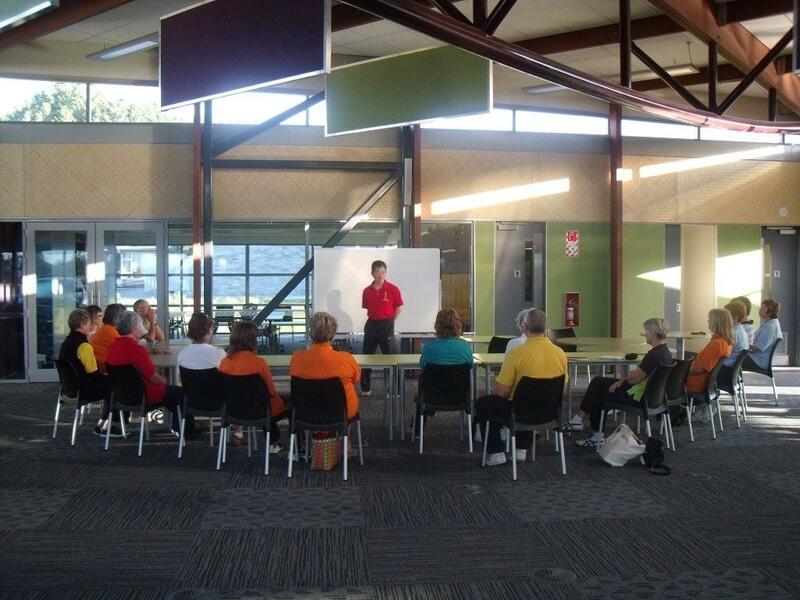 Once again, Grandmaster Tse Wei Jing (Michael) returns to Brisbane and Wellington to teach Wild Goose Qigong and Chun Yuen (Northern Shaolin) Quan seminars for the classes here and any interested newcomers. Students from Wellington, Kapiti Coast and Hawkes Bay classes, joined by colleagues from Australia, come together for this special time of learning new skills and polishing old ones. 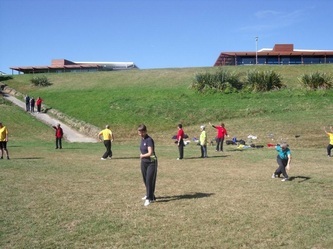 Two years ago Master Tse organised instructor training in Wellington for senior students and next March, there will be a second instructor training day this time in Brisbane. Invited students and instructors from New Zealand will travel to Brisbane for this and other seminars taught by Master Tse. 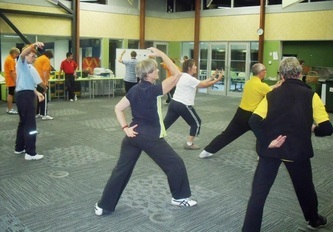 Five Tiger Breaking the Gate Dao (Chun Yuen Quan)Wednesday – Thursday 1-2 March 6.30 – 9.00 pm. Venue tba. Refining and Polishing (Chun Yuen / Qigong)Monday 6 March 6.30 pm – 9.00 pm. Venue tba. 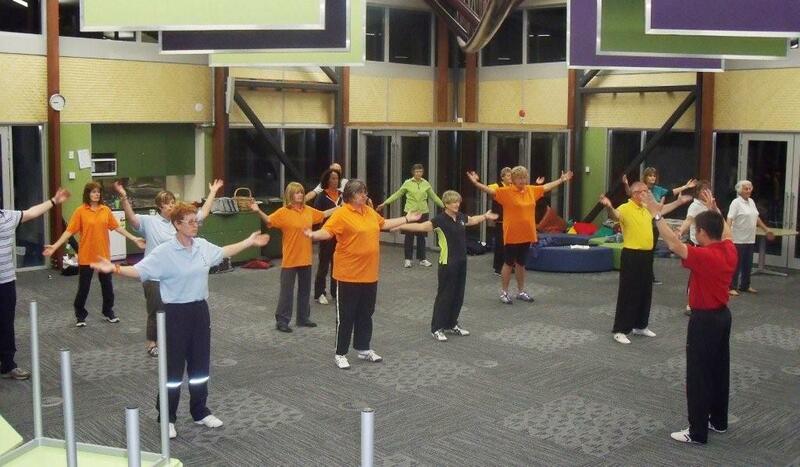 Dayan Qigong Healing Hand GesturesMonday 27 February 6.30 pm – 9.00 pm. Instructor TrainingBy invitation only. Friday 24 February. Don't miss this great opportunity to begin learning or review and polish orthe beautiful Dayan (Wild Goose) form. The 1st 64 works on post-natal illnesses and problems in the body and it helps balance the body and open the channels. The 2nd 64 works on pre-natal illnesses and problems, with the energy going deeper and with more intricate movements. For both new and experienced learners. You may enrol in one or both seminars. Each 1 day seminar costs $100 (non-members $160). Bring lunch but tea and snacks are provided. Master Michael Tse of the Tse Qigong Centre will again be visiting New Zealand in March 2014. The Chun Yuen Quan form being taught is the continuation of learning Five Tiger Breaking the Gate Broadsword. For the Qigong, Seven Star Opening Gong and Moon Gong seminars are being offered. Both forms are enjoyable and useful regardless of whether you are new to Qigong or have been practising for sometime. "This form uses a very long cloth as a colourful and noisy distraction against an opponent, helping to camouflage the knife blade. 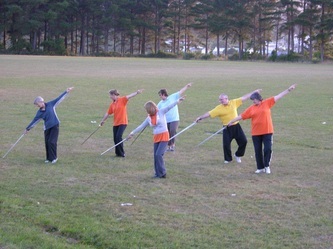 Although you may have never thought of yourself as practising weapons, they actually will train the body in a different way than barehanded forms do. Master Wu Chun Yuen still practised this form in his seventies and so we know that it is a skill for all ages. Regular practice of the form will make the body light, flexible and the mind agile as it develops coordination internally and externally." "This gentle form connects with the seven stars of the Big Dipper and the north direction. North relates to the water element and, thus, the kidneys. Healthy kidneys are very important for our good health and will give us lots of energy and help us to keep a clear and focused mind. So regular practise of this form will also help to develop our Sky Eye potential as our Qi gets stronger and body healthier. " "In this form, one of the things we do is to walk the Bagua using special hand gestures. This helps us to collect Yin energy from the moon. When the moon is full, we can get even more benefit. Yin energy which helps us to calm down Fire in the body. When someone has too much Fire, they can easily have high blood pressure, headaches and migraines, red eyes with dryness and burning, mouth ulcers and pimples. They can also have a problem with their temper, being easily angered and irritable. This form will help to smooth the Liver and Heart Qi and make the mind calm and body relaxed." An opportunity to polish, hone and perfect skills learnt in past seminars and classes with Master Tse. If you would like further information about these seminars, please send me an email through my ﻿contacts﻿ page and I will send you Master Tse's full New Zealand programme with specific dates, venue and fees. The objective of this class is for students to learn some simple and effective movements and also to gain an understanding of what Qigong is all about. This class will run for all of term four and students may join in at any time during the term. 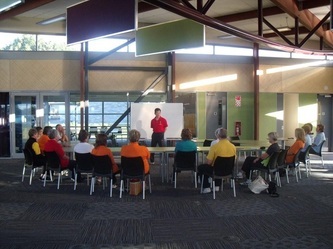 New students may also join my regular Tuesday class at 7.00pm, or Monday morning class anytime. Please see note in Classes regarding Tse Qigong Centre membership. 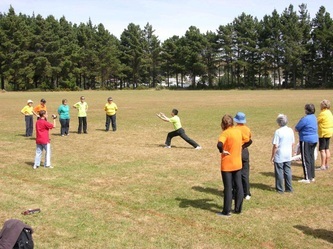 The course will consist of an introductory presentation explaining principles, philosophies and history of Wild Goose Qigong followed by learning some simple and effective movements. For registration or further information please telephone me (Belinda Hadfield) on the following numbers or you can email me through the Contact page of this website. You can find further information about regular Classes (Beginners may start anytime) by following the link. 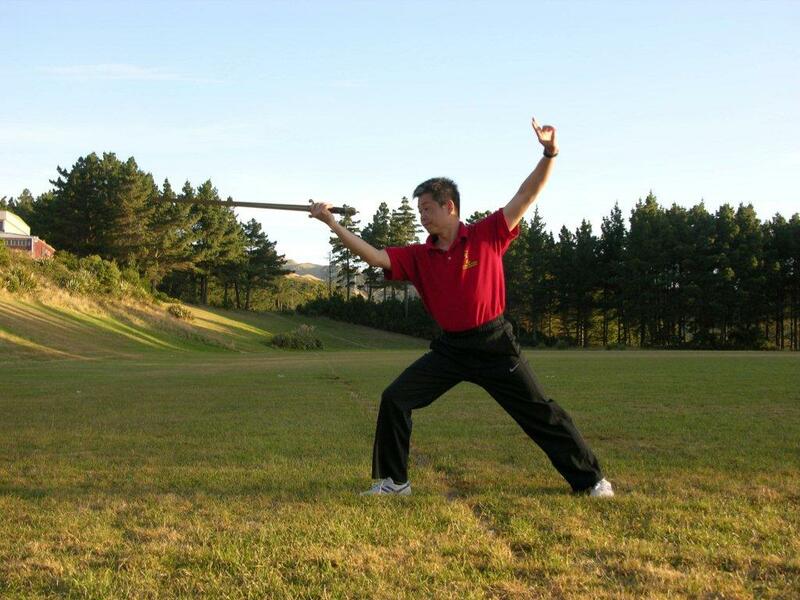 Master Michael Tse of the Tse Qigong Centre will again be visiting New Zealand in March 2014. The Chun Yuen Quan form being taught is the Five Tiger Breaking the Gate Broadsword. This is following on from last year however, students may start the form this year as well. For the Qigong, Eight Pulling Waist Gong and Peaceful and Calm Meditation seminars are being offered. Both forms are enjoyable and useful regardless of whether you are new to Qigong or have been practising for sometime. There are many special meditations in the Dayan system. Some are for helping to heal illness, some for developing Qi in certain parts of the body, some for helping to open human potential. Peaceful and Calm Meditation helps to develop the upper and lower Dantians as well as the Xiao Zhou Tian (Small Heavenly Cycle) and the Da Zhou Tian (Big Heavenly Cycle). It helps to smooth the three Yin and Yang hand channels and the Du and Ren channels. In this meditation, we use hand gestures and the reciting of poems to help direct the Qi. We do not use any visualisation or special breathing. We use the natural way and we always breathe in and out through the nose, not the mouth as otherwise we lose Qi. "An opportunity to polish, hone and perfect skills learnt in past seminars and classes with Master Tse." For Registration forms and further information, please contact Belinda. For details of Master Tse's Australian programme please click. 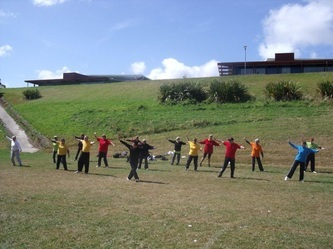 Master Tse will be visiting New Zealand in March 2013. The Chun Yuen Quan form being taught this year is Five Tiger Breaking the Gate Broadsword. For the Qigong, we will continue our learning of Triple Crossing Spiral Gong. This Qigong form is very beautiful and manageable even for people new to Qigong. You are welcome and encouraged to take this opportunity to learn from one of the great Masters. "This is an unusual form which uses spiral and crossing movements to help balance the energies on both sides of the body. As we age, we develop habits of using one side of the body and brain more than the other. The crossing movements in this form help the Qi to connect both sides of the body, helping to prevent stroke or problems with the mind." "This Qigong healing skill has been developed by Master Michael Tse using techniques he learned from his uncle, who was a traditional bone setter, as well as those from the Kunlun Dayan Qigong system and is what he uses for his own patients. You will learn more about diagnosis, massage, and even some basic Qi transmission skill." For further information regarding Master Tse's visit to New Zealand, please contact me through the website. Alternatively you can contact Sifu Cynthia Shaw (Wellington) through her website. People interested in the Wild Goose Qigong and Chun Yuen Quan skills are welcome to attend regular class anytime. The Open Evenings however, are special events where the skills are demonstrated and explained in more detail. Attendees are welcome to participate if they would like to. There is no charge for this event and if you have any queries, please do not hesitate to contact me. I will be holding a Xing Shou Seminar in Napier on the above date. To learn more about Xing Shou please visit my Chun Yuen Quan page. Master Tse will be visiting New Zealand in March 2012. We are excited to be commencing a new Qigong form, Triple Crossing Spiral Gong. Regardless of how long you have been practising Qigong you are welcome and encouraged to take the opportunity of learning with Master Tse. "This sword form originates from the Daoist Wudang Mountains. It covers all the different sword techniques and is an internal martial art skill. Based on the principles of Yin and Yang, the straight line, triangle and hexagram, this form is suitable for all levels and develops a lot of internal Qi". "This Qigong healing skill has been developed by Master Michael Tse using techniques he learned from his uncle, who was a traditional bone setter, as well as those from the Kunlun Dayan Qigong system and is what he uses for his own patients. In this introduction you will learn some basic knowledge about diagnosis, massage, and even some basic Qi transmission skill." "This is an usual form which uses spiral and crossing movements to help balance the energies on both sides of the body. As we age, we develop habits of using one side of the body and brain more than the other. The crossing movements in this form help the Qi to connect both sides of the body, helping to prevent stroke or problems with the mind." Don't miss this wonderful opportunity to polish your Wild Goose Qigong 1st and 2nd 64 with Master Tse! For further information regarding Master Tse's visit to New Zealand, please contact me through the website. Alternatively you can contact Sifu Cynthia Shaw (Wellington) through her website or Sifu Jennifer Leaf (Hawke's Bay) through her website. This workshop introduces participants to the principles and philosophies of Wild Goose Qigong and teaches some simple movements that can be incorporated in your daily routine. From my attendance at the Instructor’s Course in England, Master Tse has asked that I continue on with the teaching of Jade Pillar Gong. For those who have already started learning the form with Master Tse a Jade Pillar Gong seminar will be held in November. For the group who attended Master Tse’s seminars in 2010 and 2011, the intention is to finish the form at this seminar. The group who started learning the form in March 2011, the intention is to carry on and learn as much as possible. Another day is planned, probably towards the end of January 2012, for polishing and further learning of Jade Pillar Gong for those who do not finish the form. Please let me know by Friday, 28 October 2011 if you plan to attend the seminar. Master Tse will be visiting New Zealand in March 2011. The programme will be similar to last years so if you missed starting any of the forms then, you are welcome and encouraged to take the opportunity of learning from your Tai Sigong. Master Tse's yearly programme is extremely full and we are very grateful that he travels to New Zealand to help us develop our work. A unique opportunity to witness and experience traditional Chinese skills rarely seen in the West. With the demonstration being held in Wellington this year, those of you who live on the Kapiti Coast may like to car pool . This is a great opportunity to bring along friends, families and colleagues to show them a little bit about a health system that is so effective and enjoyable. "Age is not about how old you are...it is about how young you feel and how healthy and flexible your body and mind are. When we get older, our joints begin to stiffen, especially in our back and hips. This can affect our posture, our energy levels and even our memories. However, if we can keep these areas loose, then our kidneys can work better and keep our Qi, bones and mind strong". Open Polishing is for anyone and everyone (New People Welcome). This time is available for you to polish your work under the guidance of Master Tse. Even if you have only just started your work or you think these skills are something that may interest you, come along and experience a great evening. The programme for the evening will include approximately half an hour of dvd of the 20th Anniversary Demonstration of the Tse Qigong Centre. This demonstration was held in London towards the end of November 2010. An opportunity for you to see part of a very exciting demonstration covering other skills offered by the Centre. For further information regarding Master Tse's visit, please contact me through the website. Alternatively you can contact Sifu Cynthia Shaw and Sifu Susanne Jungersen (Wellington) through their website or Sifu Jennifer Leaf (Hawke's Bay) through her website.